Due to her older sister, Kasumi grew hating games, now in high school; she is having a hard time getting along with her classmates. One day, she is reading and sees Hanako and Olivia playing a traditional game, however, Olivia pretends to be confused by the rules and slaps Hanako. On her defense, she says she is an American exchange student, actually, she was born and raised in Japan, but prefers to mislead everyone. Kasumi tells them to stop making noise; Olivia sees an opportunity to play with her and invites her. Kasumi accepts, she dodges Olivia’s slap, but ends up hit in the chest. Instead of being surprised, she continues playing, she is a competitor, and ends up teaching Olivia a lesson. Despite her appearance, Kasumi is a bad student, specially learning English, and decides to ask Olivia for help. Olivia considers telling them the truth, especially because she does not dominate the English language. However, Kasumi is scary and decides to play along with her. As the days go by, the three girls keep sharing new games, Kasumi hates to lose and loses her temper, Olivia tries to teach her English and provokes a bigger problem, and Hanako wants to be popular. Kasumi informs Hanako and Olivia that they will join a new club, she needs to study and apparently the enjoy playing together. Olivia wonders if she will have to teach her English every time she loses a game, though, she starts liking the company. A manga series written and illustrated by Rin Suzukawa. It began serialization on Hakusensha’s Young Animal Densi website in June 2015. 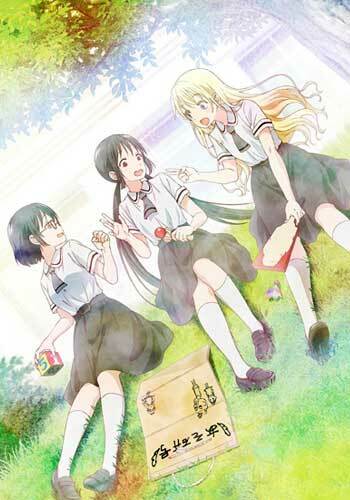 An anime series adaptation by Lerche began on July 8, 2018.